Afif's First Week of School | Teefa Says..
Yup.. You read that right. Afif is officially a student now! At first i thought he's too young for school. I mean, he just turned 3 last October. But then, he'll be 5 next year and will go to kindergarten. If he is not introduced to school and all its elements; socializing, taking instructions, writing, dancing, singing, learning the basic things, then i'm afraid he'll have a hard time in kindergarten next year. 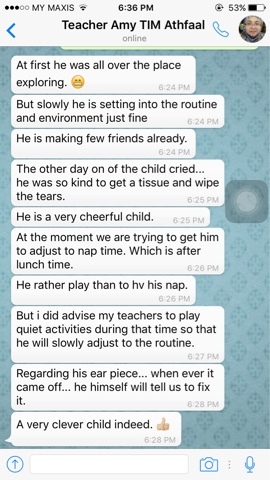 And Dr. Basha, Afif's speech therapist strongly recommends for him to go to playschool, mainly to mingle with typical kids and learn to take and follow instructions (as he's always does as he pleases in therapy, takmo ikut planned exercises). Because of his hearing loss, our priority is looking for a playschool with small student to teacher ratio. I started to look around and went to a few schools since October last year. Most schools has 15-20 students per class which is too much. Even with CI, he can't hear perfectly in noise. In the end Mr. Chenta and i chose TIM Athfaal. 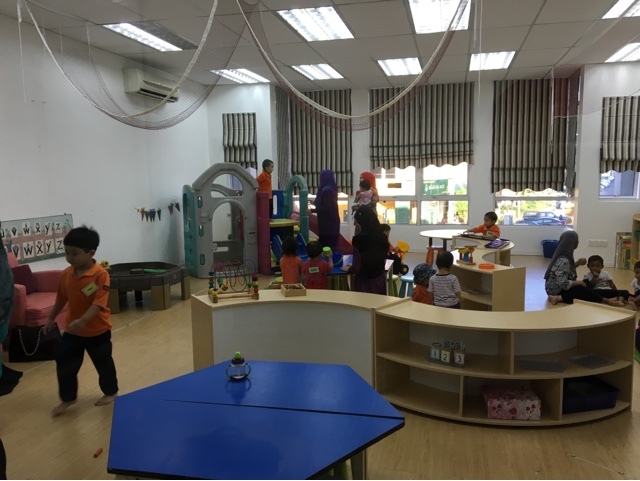 They offer smaller groups in playschool, 1 teacher for 4-5 students. They also have ANIS program for special needs children (mainly autism, ADHD, speech delay, etc) so i believe they have enough experience (not to mention patience) to teach and care for Afif even though Afif goes for the typical/mainstream class. Having the school so close to us (tak sampai 10 minit pon naik kete dari rumah) is a HUGE bonus. Dah jadi mak-mak ni cam biase la. Emo sungguh bila anak masuk skolah. 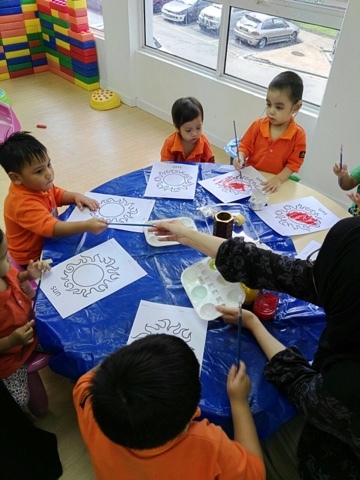 Padahal Playschool je pon. Rasa cam "dah besarnye anak akuuu" mase pakaikan baju sekolah, sediakan beg dia. Padahal dalam beg tu ade spare clothes, pampers and botol susu je pon. Baahaha. Anyway, first day of school turned out well. His first day of school was on a Tuesday (5th January 2016). We woke up early. He was a bit confused like apehal tetibe bangon awal gila siap mandi bagai. Lepas pakai baju, minom air and a bit of bread, excited gila pakai kasut and beg terus nak berlari masuk kereta. Nan hadooo nak amek gamba pakai baju sekolah bagai. Sampai sekolah pon excited la nak naik (his school is at a 3-stories shoplots. Kelas dia kat tingkat dua so kene naik tangga setingkat la). Masuk je pintu kelas tu, aku soh dia simpan bag kat rak, pastu pelesuppppp dia lari pi main. Nan hado heran mak bapak dan adiknya duduk sini. Around us there were a few anxious moms, a few kids beriba and clinging to teacher/parent, and one or two crying kids. Afif memang terus attack slides la. Pastu dia main giant blocks dengan 2 orang budak ni. Ada skali ni camne ntah dia main pastu a wall of blocks terjatuh berderai. Dia nak betulkan pastu dia baling seketul block. Kawan dia 2 orang ni nampak and they decided to follow Afif's lead of baling-baling block! Mereka beramai-ramai baling-baling blocks sambil gelak-gelak. Kelam kabut teacher nak redakan. Haha. Alhamdulillah, Afif's first week of school turned out great. Takde sekali pon nanges. Siap babai lagi ade. How did you grow up to be this big boy, son? Our view as we were leaving Afif on his first day of school. He was busy playing on the slides. The teachers are kind enough to set up a Whatsapp group for us. Occasionally we get photos of Afif at school which i obviously love! Circle time: Each morning they gather in a circle and each students are encouraged to talk. Though i don't think Afif really talks in these session given his limited vocab. Not yet. He'll get there soon, in shaa Allah. Hari Jumaat baru dapat bergambar dengan kamu, anak! Afif is ready for school while Mama is ready for work. As a mother, of course i worry about Afif being at school. i never really left him in a group of people. With his hearing loss, the worry just seems bigger you know. Do the kids peer or even pull at his hearing devices? What if he can't hear? Are the teachers okay? Did they read the manual i provide them? Does he listen to the teacher and sit down when asked or is he still wondering around, minding his own business? Does he eat? i know he can be a picky eater sometimes. Does he look for me? I decided to ask his teacher. And her reply instantly put me at ease. Yes, he follows our instructions. Though kids being kids, they need repetition. And yes, he eats everything given but only one serving. Dah habis sepinggan dia bangun main balik. This sounds just like my boy. My ever-exploring, friendly, independent, compassionate, cheerful and clever boy. especially the i-hate-naptime part. So Afif. Afif, if you're reading this wayyy in the future, please know that Mama is so SO proud of you. i pray that you'll stay pure, stay the ever-exploring, friendly, independent, compassionate, cheerful and clever boy that you are today. p/s: i forwarded this to Dr. Basha and she told me to "Celebrate the small success stories of Afif. Ur little man has just been introduced to the mainstream world!" That, my son, is what i do. Celebrate you. 1 comment on "Afif's First Week of School"